The season’s winding down and Tom Caldwell’s just hitting his stride. 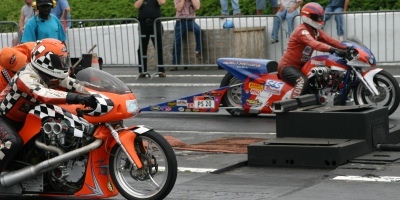 It was another win for Tom Caldwell Racing/Old Guys Do Rule Racing andqualifying #1 at 8.17 @ 161.83 mph and won with another 8.17, at the latestAHDRA race in a the beautiful valley at Numidia, Pa’s, Liberty Nitro Nationals Presented by Vreeland’s Harley-Davidson, things continue to rock and roll for Tom Caldwell Racing/Old Guys Do Rule Racing. After another win, Tom sits13 points out of 1ST place in theAHDRA Pro Stock division,and 2nd in theAMRA Pro Gas class Caldwell says, “I am really considering retirement at the end of the season, but man, what a year it’s been, everything is coming together for my program. New sponsors, the bike’s really fully prepared to complete the season and with really minimal work through the winter(STEVE & I HAVE A COUPLE OF NEW IDEAS FOR NEXT YEAR), we could be ready for the 2013 season. WHAT a decision. My body is starting to say ‘give it up’, my heart says ‘are you CRAZY?, let’s race’! After some 45 years of competing in several venues, it is a way of life. Especially, since my dad raced flat track Harleys when I was born! It’s the time of year for big decisions across the sanction, but there are 2 more AHDRA events, 1 moreAMRArace and multiple personal appearances. I wish to thank Vreeland’s Harley-Davidson for their sponsoring of the race, friendship and support of our organization. I also, want to thank Bill Rowe for supplying the VP gas, we need at the events! Here at the end of the season Tom Caldwell Racing/Old Guys Do Rule Racing itinerary includes TellicoPlains, TN Rally with HogScrap; AMRA finals at Bowling Green, KYwith Trammel Creek Cycle Works; AHDRA’s THE ROCK, NC; and No Problem. LA. Doesn’t sounds like a retirement program, does it? ?